Millennials, for the most part, are a generation of renters. Only 34.7% of Americans under the age of 35 owned their homes as of 2016, according to a Census Bureau survey. But that’s not always by choice. According to a Pew survey, 72% of renters hope to become homeowners one day. One big hurdle, especially for millennials, is that they are unable to buy affordable homes. This is especially true in cities like New York or San Francisco. There are some cities however where millennials are overcoming mortgage costs and buying homes. 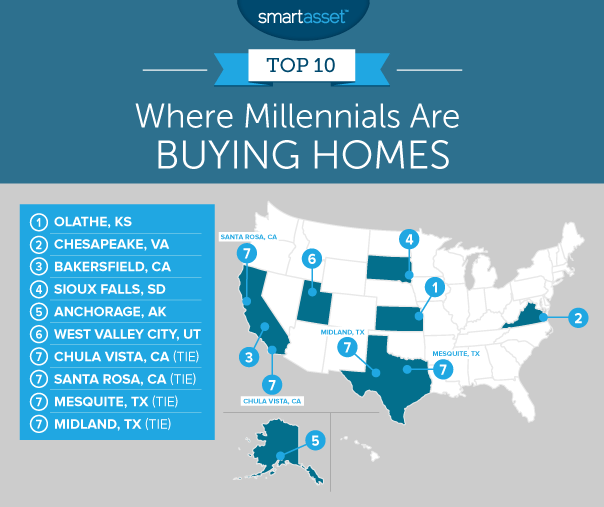 Below we look through the data to find the cities where millennials are buying homes. For this study, we looked at two factors: the 2016 millennial homeownership rate and the change between the millennial homeownership rate from 2007 to 2016. We defined millennials as those under the age of 35. Check out our data and methodology below to see where we got our data and how we put it together to create our final ranking. This is the third annual edition of this study. Read the 2017 version of Where Are Millennials Buying Homes? here. No big cities – No big city cracks our top 10. The biggest city to crack our top 25 was Las Vegas at 22. In fact, seven of the top 10 largest cities are ranked in the bottom half. New York and L.A. in particular score poorly, ranking 148th and 153rd, respectively. Last year Kansas had two cities ranked in our top 25, neither of which were Olathe. In fact Olathe was not included in the study due to population filters. But this year it comes out on top. Our data shows that over 50% of millennial households in Olathe own their homes, the fourth-highest rate in our study. That is an increase of 4.8% from 2007, the second-largest change in our study. 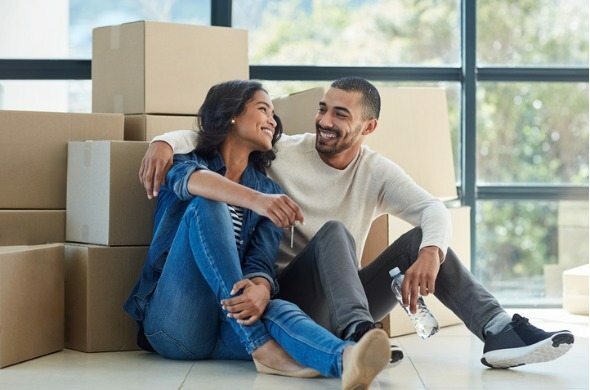 Chesapeake, Virginia has a high millennial homeownership rate. As of 2016, 54.4% of millennial households own their homes. What kept Chesapeake from taking the no. 1 spot is the fact that the millennial homeownership rate is down from 10 years ago. In 2007, 55% of Millennial households owned their homes. For the second year in a row, Bakersfield takes the third spot. Bakersfield scores better than 85% of cities in both of our metrics. Our data shows that in 2016, 36.7% of millennial households are homeowners. That is a decrease of 1.3% from 2007. For millennials who can afford it, buying a home in Bakersfield may not be a bad idea, California has below-average property tax rates. About 35% of Sioux Falls millennial households own their homes. At first glance that number may not be impressive but it’s a score which beats 176 other cities in our study. Millennials homeownership is almost at the same rate it was 10 years ago. According to our data, the millennial homeownership rate in Sioux Falls in 2016 is only 0.9% lower than it was in 2007. One reason millennials may be buying homes in Sioux Falls is the affordability of the homes. The median Sioux Falls home is worth $173,400. There are only 18 cities in this study where millennial homeownership rate rose from 2007 to 2016 and Anchorage is one of them. This gives the city a big boost in the rankings. From 2007 to 2016, the millennial homeownership rate rose from 30.5% to 32.5%. It would be hard to find another city where millennials take homeownership as seriously as they do in West Valley City, Utah. According to our data, the majority of West Valley City millennial households own their own home. To be more precise, 51.8% of millennial households own their home. That’s the third-highest rate in our study. However that number is down from 2007. In 2007, 55.1% of millennial households in West Valley City were homeowners. Chula Vista starts off a chain of four cities tied for seventh to close out this top 10. Millennials who have managed to buy a home around Chula Vista have fought an uphill battle. According to our data, homes here are worth $464,500 on average, the second-most in our top 10. As of 2016, 32.9% of millennial householders live in a house they own. That’s an increase of 0.9% from 10 years ago. Santa Rosa is the fifth-most populous city in the San Francisco Bay Area. To own a home here you probably need to have a pretty good job or a sizeable down payment. The median home in Santa Rosa is worth $484,400. More and more millennials are choosing Santa Rosa as a place to buy a home. According to our data, the millennial homeownership rate in Santa Rosa has shot up 11% from 2007 to 2016. That’s the largest increase in our study. Mesquite shares some characteristics with Santa Rosa. Back in 2007 not many millennials owned their home – only 29.8% did, according to our data. But recently that has changed. By 2017 that number had increased by 2.1% to 31.9%. 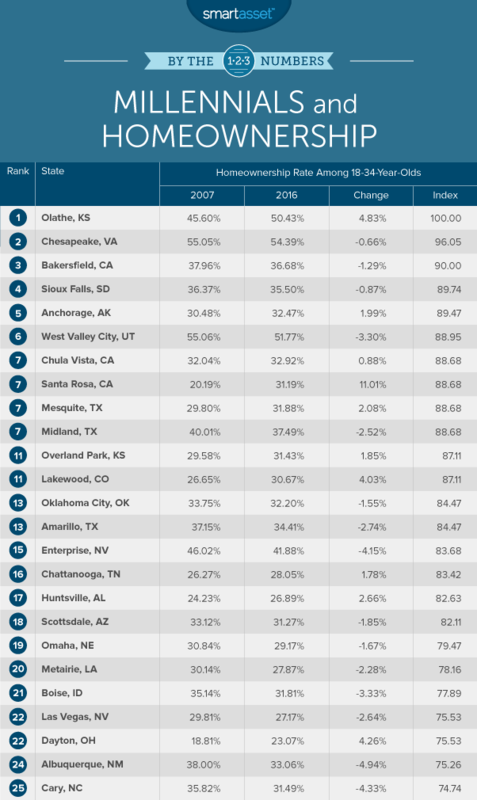 For millennial homeownership rate change, Mesquite ranks sixth. Midland is in the top 10 due to its high 2016 millennial homeownership rate. Our data shows that as of 2016, 37.5% of Midland millennial households were homeowners, a top 20 rate. Unfortunately, our data also shows that millennial homeownership is on the decline in Midland. From 2007 to 2016, the number of millennial households who own their homes fell by 2.5%. One reason Midland millennials may be eschewing homeownership is Texas’ high property tax rates. The 2016 millennial homeownership rate. This is the percent of millennial households who own their homes. For this study we defined millennials as those under the age of 35. The 10-year change in Millennial homeownership rate. This is the percent change in the millennial homeownership rate from 2007 – 2016. Data comes from the U.S. Census Bureau’s 2007 and 2016 1-Year American Community Surveys. First, we ranked each city in each metric. Then we found each city’s average ranking giving equal weighting to both metrics. Using this average ranking we created our final score. The city with the best average ranking received a score of 100. The city with the worst average ranking received a score of 0. Data analysis for the study was done by Nick Wallace.